Didn't see that coming as final break was @ 37 minutes. 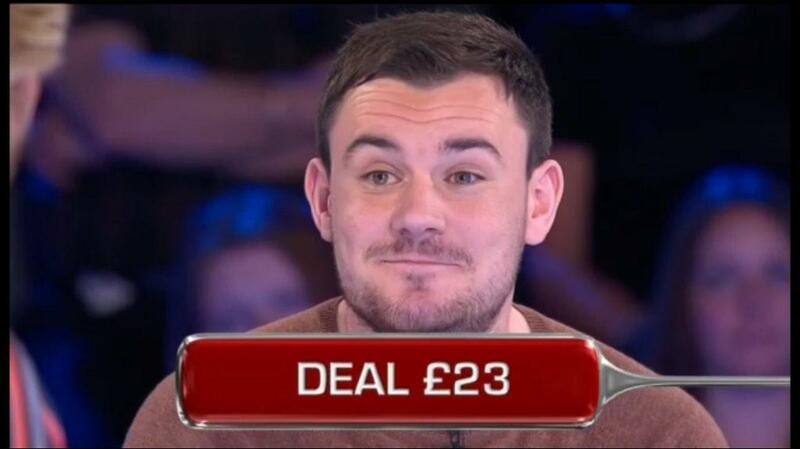 Don't blame him at all for taking £26,000. Hopefully he didn't miss out on a Power 5 win. Show is only 55 minutes long today though. Noel reminds us of the importance that Corie plays on as he would've played on. Corie goes for Vicky, but Noel gets irritated as he previously said he'd leave Vikki. Noel says the dream finish could still happen. £32,000 would've been a Deal without the button but a No Deal with it. 46 minutes of the game. What is that I sniff? Oh, it's the BANKERS GAMBLE! Noel says this could be a comfortable late game turnaround. He's already been reminded twice what he had yesterday thanks to Noel, BUT will he be extremely 100% very brave to accept the offer? The final ever power five win in the studio? Corie is too much of a family man to take this on. Corie says his box number, 17, is his lucky number. Noel reminds Corie that the SWAP is guaranteed with the banker's gamble. The other asks how he'd feel if he left with £10 and Corie says his wife would kill him! Corie says he would not have swapped. The Banker offered a massive lifeline. The final ever bad answer to box 23 coming up? Why do I have a funny feeling Box 23 has +£10,000? Corie says he could still win £52,000 through box 23 and be halfway to the £100k. He runs through again what he could do with the money.